Like many UXers, I’m a huge fan of Erik Kennedy’s Learn UI Design. This one course has done more for my design skills than anything else in the last couple of years. It’s helped me gain more confidence and add more value to client projects. Erik’s course will be open again in a few weeks, so I wanted to share some lessons I’ve learned from him this past year. Really hard. And sooo different from UX design. There. You’ve been warned. The two skill sets are completely different, yet compliment each other beautifully. Why is UI Design so hard? 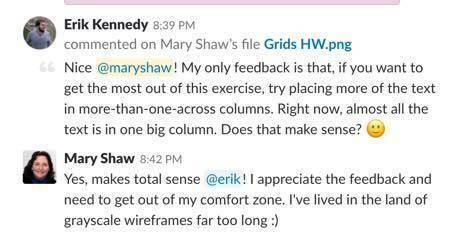 Well, for me I think it’s because I’ve been living in a black and white wireframe world for so many years. Before getting interested in UI design I was mostly concerned with the big picture around digital strategy, user research and information architecture. While UX design is all about how something works at a macro level, UI Design is all about the micro view. It’s about solving design problems at the detail level. Dozens of tiny little design decisions often make up a single screen. Every font, button, shadow, line or color needs to have a specific job to help users achieve their goals. In other words, if an element isn’t placed there intentionally it’s just decoration. In the past I always teamed up with a visual designer who would dive into the design details after I handed off wireframes. But the industry demands stronger skill sets now and I’m all for continued growth and improvement. The other reason UI Design is so hard is that landing on an effective design solution requires lots of experimentation with all those little details. Good UI rarely hits the mark on the first try, so it’s important to iterate. But at some point you have to know when to stop. How do you know when? It takes tons of practice, inspiration and experience. And that’s why Learn UI Design’s course homework is so valuable. You get lots of focused practice on individual concepts and plenty of resources to inspire your designs. I look at interfaces very differently now with a much more critical eye for the small details. I think that’s what helped me land a 6-month retainer client last year before I was even halfway done with the course. I’m still working to finish all the homework, but the course paid for itself within the first few months after I bought it. Sketch is my preferred design tool, although you can do everything in Learn UI Design in other design tools such as Adobe XD or Figma. One of the introductory lessons is a 45-minute deep dive into almost every shortcut you could ever want in Sketch, as well as some great tips to set up your software environment for maximum speed and efficiency. That video alone has sped up my workflow so much. Having the ability to deliver projects faster will add tremendous value to your clients. Typography and color have a huge influence on the success or failure of a design. And the plethora of available screen sizes makes choosing and pairing fonts crazy business. Erik’s chapter on typography lays it all out, with updates for Material Design and iOS. You’ll also learn why picking a color palette is actually not a best practice and why. 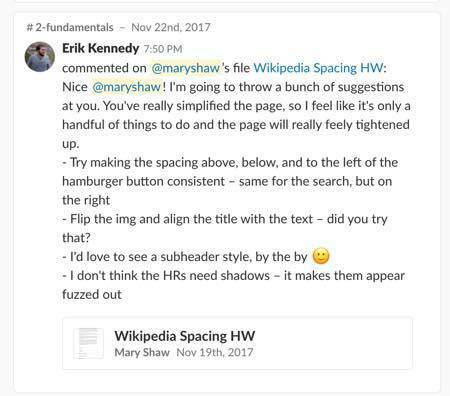 Even better than the super-detailed instructional videos, you’ll get feedback on your designs directly from Erik via the course Slack channel. I don’t know how he does it, because this guy literally has hundreds of students at this point. But if you post your homework in the Slack channel, Erik will review it and give you timely constructive criticism you can take to the bank. If you’ve read this far you’ll really enjoy my next post. 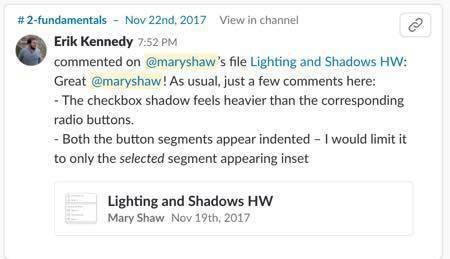 Erik has generously given me permission to do a demo video inside Learn UI Design and its companion Slack channel. You’ll be able to see for yourself whether or not it’s a good fit before the course opens again on Sept. 6th. In the meantime, if you have any questions please leave them in the comments and I’ll answer them as soon as possible. I used your link to try to go to the Learn UI Design Courses, but the purchase option is not available. I guess I missed my window of opportunity 🙁 Do you know, by chance, when the next round of open enrollment will be? I would LOVE to get started immediately. Hi Rafael – thanks so much for your comment. I believe Erik will open the course again sometime in March 2019. Be sure to signup to get notified when it opens. Hope that helps!